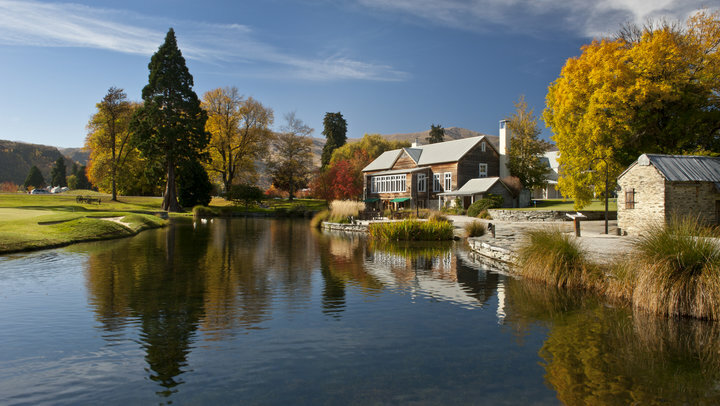 The Queenstown region is among the most beautiful in New Zealand, and for golfers encompasses courses on Lake Wakatipu near the heart of Queenstown, as well as those a short drive away in the gold rush town of Arrowtown. The best known of these is the Millbrook Resort, established on farming ground in the 1990s with an 18-hole course designed by Sir Bob Charles. A third nine at Millbrook (Coronet) was added in 2010, designed by fellow tour professional Greg Turner. At first glance Millbrook appears your typical 1990s resort style golf course, with little sophistication in design and an emphasis apparently on fast, sloping greens and conditioning over strategy and interest off the tee. Fairways and greens are often flanked by bunkers that really only act to reinforce the view that straight down the middle is your ideal aiming point. In truth Millbrook is much better than it appears, however, with some really sound golf topography on display across the resort, and a decent routing that makes use of views of the surrounding Remarkables Mountain Range. The newer holes on the Coronet Nine by Turner are probably the standout and more likely to feature greens that are angled or arranged to suit a particular line from back in the fairway. His bunkering also fits the rolling terrain much better than the older sand-pit style traps. The prairie nature of this area and the more obtrusive residential component are a drawback, but there are strategic choices to be made here and a couple of really bold, contoured greens that linger in the memory. Turner also redesigned some strong holes on the Arrow Nine, including the par four 8th with its wickedly falling green site and the unusual horseshoe 7th. Of the older Charles holes, there isn’t anything outstanding on his Remarkables Nine but there is enough undulation to keep most amateurs interested and several really strong tests, such as the uphill par three 2nd and twice-crested par four 4th, to hold the attention of the good golfer. The standard of design across the more established areas fails to match the newer holes, but the routing and topography are both solid enough to suggest that with the right refinements this could become a terrific layout. The resort itself at Millbrook is charming, and the area so popular with holidaymakers that the appeal for visiting golfers is easy to see. Were the other local courses of a higher standard it might suffer by comparison, but Queenstown is really your classic good golf in a great destination type location.